Arbitration in Germany. The Model Law in Practice provides you with a comprehensive analysis of German arbitration law. Written by leading practitioners and academics, it provides insights both from, and for all legal sectors where arbitration plays a role. 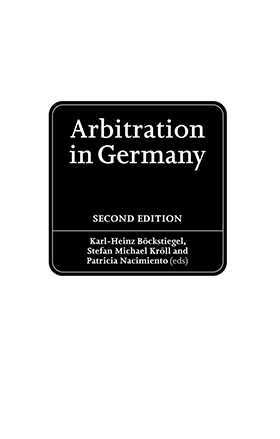 Until the first edition of this book, there had been no comprehensive and detailed presentation of the German arbitration law in English. In particular, no easily accessible Article by Article commentary existed. The positive feedback to this work, and the developments since its publication in 2007 have led to this timely new edition. You’ll find a clear, detailed discussion of the many issues that can arise in the course of commercial arbitral proceedings. The authors offer comprehensive guidance to all parties either planning to arbitrate in Germany, or which are already involved in arbitral proceedings or arbitration-related court proceedings in Germany. The first full, detailed commentary in English on the German arbitration law, this work also includes the rules of the German Institution of Arbitration (DIS). Arbitration in Germany. The Model Law in Practice - Second Edition will provide an invaluable resource for anyone working in this area to understand the Model Law in any of the jurisdictions that have adopted that law.